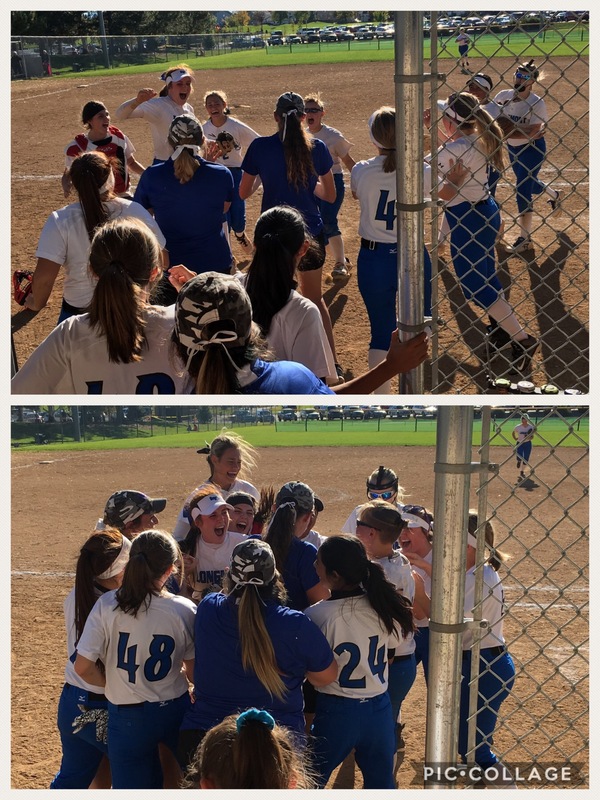 Longmont High Varsity Softball faced Weld Central for the second time in the regional tournament Saturday, October 13th after losing to them 0-7 earlier that morning. This time, the Trojans faced the Rebels fearlessly with high aspirations of becoming state qualifiers. Being the lower seed team in the regional bracket, the Trojans were the visiting team again but they did not seem phased by it. Ayahna Bustamante (SS) was stitched to the lead off position where she did a great job of setting the tone for the game. She led off with a single line drive to right field. The Trojans had a total of three base runners their first inning but did not reach home to score. The Rebels scored their first, and only, run in the bottom of the first inning with two singles up the middle. It was in the top of the second inning when Longmont really decided to take over the game and make it theirs. Katrina Sabol (CF) made a statement while she led off with a single ground ball up the middle to reach base safely. Sherena Simmons (RF) slashed a line drive into left center to score Sabol for the Trojans’ first run. Tied ball game. Bustamante advanced Simmons with another single up the middle and with two runners on, Kayla Gumeson (3B), pounded the ball over the left field fence for a three run homerun. The Trojans scored a total of four in the top of the second inning. Longmont continued to get baserunners on for the next three innings but did not score again until the sixth inning. Meanwhile, Angeline Mitchell (P) was dialed in on the mound, not allowing another hit for Weld Central. She had seven strikeouts, faced 26 batters in seven innings and threw just 81 pitches total. The ball left the infield just five times, three of which were caught fly ball outs. Trojans decided to get some insurance runs in the top of the sixth inning to solidify their efforts of being state contenders. Katie Alaniz (1B) led off the inning with a hard ground ball through the left side of the infield and Grace Morrow (LF) followed with a line drive to left field. Bustamante had a timely double up the middle to score Morrow while putting herself and and Simmons in scoring position on the bases. Following, Gumeson earned two more RBI with a hard ground hit to left side scoring Morrow and Simmons. Alexa Nielsen (C) hit the final RBI, hard grounder up the left middle to score Bustamante. The Trojans scored a total of four runs in the top of the sixth inning. Other highlights include; Bustamante hit 1.000 at the plate, 4-4 with a double and RBI. Nielsen hit 2-4 with an RBI and from behind the plate, caught one runner stealing. Ashley Dillow (2B) hit 1-3 and had four putouts in the field catching two line drives and a deep flyball. Gumeson hit 2-4 with a HR, five RBI, and three fielding assists. Morrow and Simmons each hit 2-4 and caught a fly ball in LF and RF. Alaniz hit 2-4 and had four putouts at 1B. Winning their second game, playing three, the Longmont High softball team has made it to state. The softball team last competed in state, 15years ago, back in 2003. This team has made incredible efforts and success this season so far. Their overall current record as 18-7-1. The Trojans play in the State Championship Tournament Friday, October 19th against Erie High School 12:15pm at Aurora Sports complex. Below are links to the Boco Preps article and regional photos from this weekend.